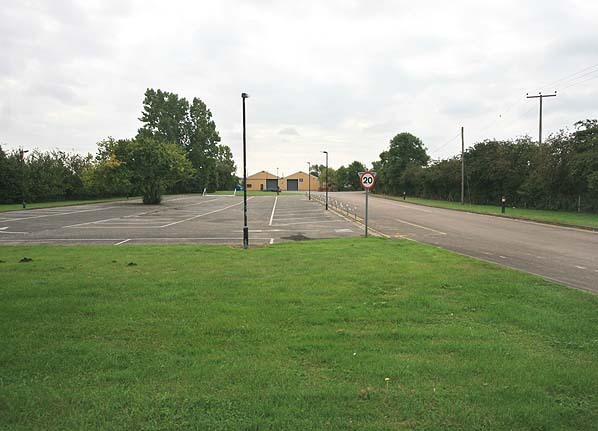 Present state: The station has been demolished and the site is now occupied by the car park for UK Fixings (Southern) Ltd.
Notes: Sutton was the terminus of the Ely Haddenham and Sutton Railway but when the line was extended to St. Ives the orientation of the station meant that the station had to be resited to the south on a new west facing alignment. The original station was retained as a goods station until closure of the line in 1964. As the Eastern Countries Railway pushed north from Cambridge towards Brandon it reached Ely in 1845. In the same year the Ely and Huntingdon Railway was authorised but, because of monetary difficulties, only a short section from St Ives to Godmanchester, just over 4 miles, was constructed and opened for traffic in August 1847, the same day as the Eastern Counties Railway opened its line from Cambridge to St. Ives. Lack of finance resulted in the abandonment of the Ely – St. Ives section but the East Anglian Railway which had acquired the Ely and Huntingdon, resurrected the scheme and obtained an Act of Parliament in July 1849 to build the railway but the authorised time for construction lapsed and the line was subsequently shelved. The merger of the Eastern Counties Railway with the Eastern Union and other East Anglian railways to form the Great Eastern Railway (GER) in August 1862 caused a change in policy regarding official encouragement for local branch lines. Thus in late 1863, two prominent landowners from Wilburton and Haddenham campaigned for a line winning the support of other local landowners in the area to promote the building of a railway linking Ely with Sutton and a Bill to construct the line received Royal Assent in June 1864. The Ely Haddenham & Sutton Railway was authorised for opening to all traffic on April 7th 1866 with intermediate stations at Stretham, Wilburton and Haddenham. The railway was opened to the public on 16th April 1866 with little enthusiasm shown by the local population due to prohibitive fares between Sutton and Ely, there were only three passenger trains in each direction per day. Initial passenger receipts were disappointingly low but passenger numbers eventually improved and there were a number of proposals to extend the line to the west and south of Sutton. In 1868, plans were formulated for the Haddenham, Willingham and Longstanton Railway and a Bill for this line was presented to Parliament in 1869; another venture, the Sutton, Mepal and Somersham Railway failed to get its Bill past the parliamentary deadline. With the failure of these local schemes to extend the line westwards to St. Ives the future EHSR was in doubt, but in 1872 a further proposal to extend the line to St Ives was formulated and presented to Parliament in 1876. The extension from Sutton to St. Ives opened on 10th May 1878 with intermediate stations at Bluntisham and Earith Bridge with an increase to five passengers trains per day..
Because of the orientation of the terminus at Sutton a new station was build with the old station being retained for goods. The company was renamed the Ely & St. Ives Railway and was eventually taken over by the Great Eastern Railway in 1898. The period following the First World War brought a rapid decline in passenger numbers which had always been of a secondary to freight traffic. The stations were all remotely sited from the villages they were supposed to serve and in most cases involved a long walk from the village to the station. With the advent of the car, there was an improvement in local roads and in 1919, the first local regular bus service was introduced. In 1922 the GER, attempted to counteract the loss of passenger receipts by closing booking offices at all the branch stations except Haddenham and issuing tickets on trains. Although this reduced operating costs it failed to increase passenger traffic at branch stations. In 1922 the GER was absorbed into the London & North Eastern Railway (LNER). In 1928 passenger receipts on the Ely to St Ives line amounted to only £7,562 but freight traffic remained healthy and indications were that the tonnage would increase. By now there were only three trains a day and it was therefore proposed to withdraw the passenger service from 2nd February 1931 and an arrangement was made with a local bus company to provide alternative services. The closure of the line received little mention in the local press and as so few people used the trains little inconvenience was experienced once it had closed. In the late 1920’s and 1930’s the branch was at its busiest between June and November. During this period train loads of fruit pickers were conveyed by special trains to the branch stations where they were picked up by the local farmers to help with fruit picking and the harvest. During the 1930’s until the outbreak of WWII, two goods trains ran daily with the milk and parcel traffic, previously conveyed by passenger trains, being carried in the van attached to the freight train. Sugar beet was carried to the Ely beet factory and other freight included cattle, other livestock, building materials, manure, agricultural components in addition to the fruit and produce during the harvest season. WWII brought an additional increase in military materials conveyed to Sutton for forwarding to RAF airfield at Mepal. After WWII fruit, parcels and milk traffic quickly transferred to road and gradually other items were lost from the railway to road transport which could offer a door-to-door service and by the 1960’s the majority of produce was carried by road. Two annual passenger excursions ran from St. Ives to Ely en route to Great Yarmouth and Hunstanton until 1958; passengers were conveyed from all branch stations. The section of the line from Bluntisham to Sutton was closed to all traffic in October 1958 and the tracks lifted, the line between Sutton and Ely was retained to handle dwindling sugar beet and vegetable traffic but eventually closed on 13th July 1964. The west end of the line between St. Ives and Bluntisham which had remained open to serve the mill at Bluntisham, but this too lost its freight service from 5th October 1964. The remaining track was lifted within a year of closure and much of the trackbed reverted to farmland or because of its raised position above the surrounding fenland, as access roads.